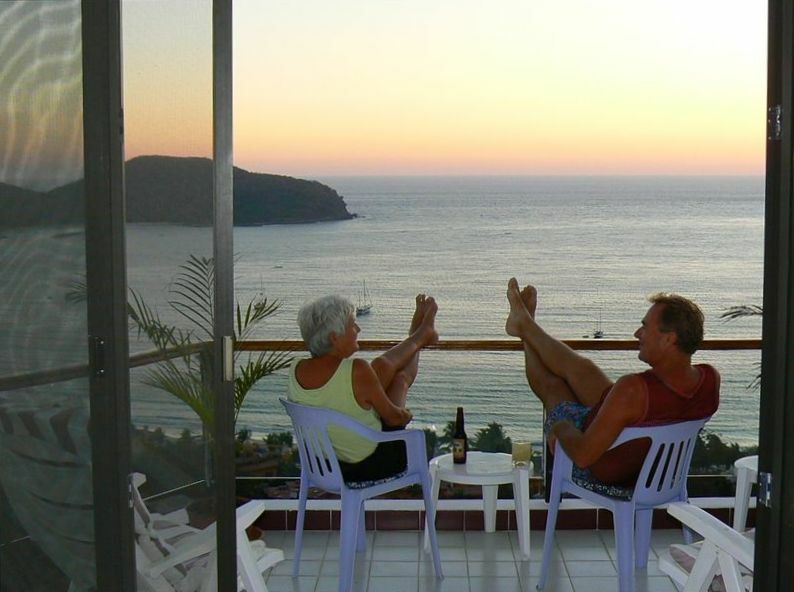 Best View of Any Zihuatanejo La Ropa Beach Condo!!! Well by now you have likely read many other descriptions of how beautiful and friendly Zihuatanejo is, and how close the lovely La Ropa beach is to all the vacation rentals there. You have also likely read that La Ropa beach is very good for swimming, so on any given day you will likely see a couple hundred folks in the water having fun. Su Escapada has all this just like the more expensive places, but there is something here that you will not likely find at other rentals in the La Ropa area…peace and quiet and PRIVACY. And here’s why- at Punta Penasco (the building name) there are ONLY four units in the whole building (just four!). What you will be renting are the TWO top floors with the TWO top ocean-view decks. Unlike larger condo developments, you do not have people coming and going day and night...no hotel atmosphere here. Su Escapada is QUIET and PRIVATE. The upper deck is off the bedroom and the next one down is off the living room. The other three units here are occupied by other gringos who may or may not be here when you are. The building is usually totally yours to enjoy during the day, and mostly at night as well. You might find it nice to not have others around when you wish for a private swim in the pool as the pool is rarely used. These two decks, one off your upstairs bedroom and the one off the living room (both with 100% beach/ocean views) are totally private and not seen from other units (wink-wink). Su Escapada, in the four unit Punta Penasco complex, has something else that you will long remember…it is at just the right height above the beach that allows only the pounding sounds of the small surf to be heard day and night - NOT A PEEP of the jet skis and parasail powerboats can ever be heard unless you are down near the beach itself. And here’s another nice feature of Su Escapada- you have a 99% guarantee that you will have a nice sea breeze coming in from the ocean year around. What this means for you is that the air conditioning is rarely needed.....or even the many ceiling fans for that matter. Just keep the huge glass doors on both the upper and lower decks open and the back windows open and the cooling effect is usually perfect as it flows through the house to keep you cool and free of A/C noise. Of course the A/C is always there should you wish it. Even the many fans will not be needed as a rule thanks to this gentle breeze. All this adds to the peace and quiet of your vacation that you will long remember. And if you are the type that enjoys keeping in touch while you are on vacation, Su Escapada offers high-speed DSL wireless internet. In fact, you will be able to even use the wireless signal poolside if you wish. And you will find all the news you can stand and hundreds of commercial-free music stations with the WiFi internet radio on the living room level. Taxis are cheap in Zihua IF you agree on the price before you get into the cab. With a one minute walk down to the main (only) road you can snag one of the many taxis going by day or night. Su Escapada phone works for local taxi and pizza calls and incoming calls from home. The city bus for downtown stops nearby as well. But if you want to skip a taxi, just another four minute walk from there will get you to the many waterfront restaurants. One of which is Paty’s- known for the best shrimp cocktail and tortilla soup in all of Zihua. Zihuatanejo, besides being a safe clean friendly town, it has one of the most user-friendly airports you will ever use. And La Ropa beach is just a 20 minutes drive from the airport (ZIH). At this point it’s necessary to bring up a few things you should know about the Su Escapada so you will be well informed as to what is being offered here. First, be aware that there are a fair number of stairs from the parking lot up to the pool area, and then there are another three level of stairs to the front door. If you have problems with stairs do not consider staying at Su Escapada. Next- This well cared for condo has never known the smell of a cigarette- absolutely no smoking inside or on the decks- in fact this is a no smoking building in total. Please, if you are a smoker do not rent here. You will loose your security deposit if you smoke here. Finally, please no pets of any kind. Sleeping arrangements- the upstairs bedroom has one huge bed (8’ wide x 6.5’ long) and there is one full bathroom on this level. The two sofas downstairs serve as twin beds and can sleep two adults or children (over 13 only please because of the drop from both decks is considerable). There is a full bathroom on this level as well. The kitchen is well equipped to dine four people. To keep rates low, maid service is not included with stays under 10 nights. Should you wish daily maid service, please let me know so I can arrange the level of service you wish to have. Maid service is $20 USD/day used. Remember- you have a clothes washer and dryer right in Su Escapada so personal items and sheets are done easily by you if you wish. RATES: Minimum stay is five nights, and seven over Christmas/New Years. Weekly rates shown are based on five nights. For stays of 30 days or more, please contact owner for special rates. There is a $250 fully refundable security deposit requested with final payment 30 days prior to arrival. Lock in your dates with a 50% deposit. Cancellation policy- 100% credit for future stay up to 90 days prior to arrival/no credit or refund after 90 days prior to arrival. We were first attracted to live here because of the safe and economical living conditions, and that is still what keeps us here. We bought in Zihuatanejo because it is a friendly easy area to get around. It is clean and safe with good medical care available. And when we stumbled on this condo, with a view like being up in an airplane, it was all over. One of the great delights of Zihuatanejo is the 'mercado publico', the public market in the Centro...downtown. The fruits and vegatables come in from the local farmers...really, just a BIG farmers market. And the fish market there has everything and soooo fresh. And because we are just a four unit building, the atmosphere is quiet, private and friendly. AND have you ever seen a better view? The hills around Zihuatanejo Bay at night with all the lights are quite beautiful from either of the decks. See the pictures- Ocean view or what! Both floors have a remote controlled air condition unit should you wish to use. However, most folks find opening the windows and doors on both the front and back sides allows the great daily sea breeze to flow through. And this also allows you to hear day and night the pounding surf. Su Escapada has it's own laundry room- it is not shared. Laundry soap provided. Electric iron provided should you wish to REALLY get fancy. 24/7 broadband TelMex WiFi. As with all internet in Zihuatanejo, to be honest, you will find times with lightning-fast speeds and times with slower speeds (but in general it is very good most of the times). You will find up-scale cookware and good knives, a juicer for the very inexpensive oranges here, blender, timed coffee pot, and a gas range with griddle for hotcakes or tortillas, and a nuker. Choose between dining in the kitchen area or better yet on the deck table where the BBQ is located. Actually a WiFi internet radio where you can get any radio stations you are used to having. This is above the lower deck and with the same great view to the sea. Two cocktail tables and lounge chairs are there to watch the great sunsets nightly. Kayaks are rented at various beach locations. (2) As the daily breeze usually dies off just before dinner time, most folks dine on the lower deck using the four seater glass table. The view is beautiful there for dining and candles are provided for the table. The Viceroy resort area has tennis guest tickets- a 5 minute walk away. A 20 minute taxi ride gets you to several in the nearby Ixtapa resort area. The advertisement does not lie. It is the best view of anywhere in Zihautenejo. We stayed for 4 weeks and thoroughly enjoyed our stay. To wake up to the ocean views and to end the days with a glorious sunset was ice cream for the soul. We left with renewed gratitude for life. Thank you Jim. This was definitely the best view we have ever had. Really enjoyed having dinner on the patio and then late night drinks on the upper deck. The only negative is the 137 steps up to the unit. Our legs are in much better shape now. The location is very good with good access to the beach. Great place! Yes indeed...just look at the health club membership we saved you. So glad you enjoyed your vacation condo selection. Hope to see you back. Loved our stay here. Everything was exactly as described. We arrived early and the manager was waiting for us. She even helped us carry our groceries up. The condo had a well equipped kitchen, plenty of bed & bath linens, and thoughtful touches like beach umbrellas, carrying bags pool noodles, etc. We rented a car so we could explore. Got up early and parked the car at the beach with all of our gear. Then we could walk to the beach and drive back ;) We loved being able to sleep with the windows open. We only ran the AC one time, otherwise everything was open all the time. We were lucky enough to stay over New Year’s and the fireworks were amazing! They shot them off from 3 places and the view from the top deck was spectacular! We would not hesitate to stay here again! The best view comes with a perk you might not expect: exercise. Is that bad? Not if you want to justify the typical vacation consumption of food and drink. The 96 steps up to the condo come after an arduous hill climb up from the beach - to the tune of likely more than 100 feet in elevation. (Taxis will drop you at the foot of the 96 steps, you don't have to do the extra climbing) So we came home with greater leg muscles than when we arrived. Not bad really. Did I mention the view? We tried on a few occasions to find a sunset view at the beach which would suit our taste, and while there are many places to sit by the surf and watch the sun slip below the horizon, none were in fact as good as on our "own" balcony. Thus we made sure to spend each sunset at our temporary home with our own drinks in hand. Need a ride somewhere? Just walk down the steps and down the drive and in moments there will be an empty taxi coming by that will stop and pick you up to take you wherever you desire. Do you like the sound of the waves crashing on the shore? We left all our windows open and enjoyed that rhythmic sound at all times of the day and night. Wonderful. Oh, and at this elevation there's a constant breeze - priceless. Hate to take keys with you to the beach for fear of loss? Well this condo provides an attached key container on the door. Punch in the code, lock and unlock, reattach. A little perk with big rewards. Full size kitchen and appliances. Appropriate tools for cooking and making drinks. Well maintained. High quality unit. Single bedroom with a king size bed. If any others will be sleeping there they will be relegated to sleeping on the built in (concrete) seating with cushions as covering. (Standard style from what we've seen) So just be careful about expecting more than a pair to be in a comfortable sleeping scenario. In the end there is a single over-riding reason to rent this for your vacation: the view. It's truly exceptional. This was one of my all time favorite VRBO rentals for its price- you've found a jewel if you're reading this! If you've never been to Zihuat, La Ropa Beach is the best area to stay (best swimming and nicest beach). This unit is a five minute taxi ride from downtown for dinner, ten minute taxi ride to big grocery store, and about a ten minute (steep) walk down the hill to La Ropa Beach and the beach bars. As for the unit, the master bedroom had a perfect view and a very comfortable bed and pillows. The cold welcome beer, basket of fresh fruit, and locally ground coffee waiting for us upon arrival were such thoughtful gestures. There was even laundry soap for use. In the past, my parents stayed right next door at a much more expensive place and besides the pool area, I liked this one more. Even though there's no infinity pool, you do have an infinity couch view (don't fall out the window)! We made it to eight different beaches in six days by walking, taxi to water taxi (60 pesos) or by bus (7 pesos). The manager (via email) answered our gringo questions right away throughout the week. In summary, members of my family have stayed at VRBO units all over the Yucatan Peninsula and Pacific Coast of Mexico, and this was one of the best rentals for its price. Often enjoyed is spending the day at one of the seven La Ropa beach 'on-the-beach' restaurants on one of their lounge chairs with unbrella while people-watching or reading. Several restaurants offer the chairs/umbrellas at no charge when ordering a beverage now and then. For bookings of 10 nights or more a 10% discount is offered. A 15% discount is offered for 30 nights or more. Please note- the Christmas and New Year 7 night blocks are offered as a 7 night block minimum but can certainly have add on nights at the normal rate of $145/night.